In 1902 the first twentieth-century VR locomotive design was constructed at the Newport Railway Workshops. The DD class 4-6-0 designed for both freight and passenger duties proved so successful that 261 locomotives had been built by 1920. Initial duties included fast passenger express trains, making full use of the class permitted speed of 60 miles-an-hour. Displaced from express passenger work by the introduction of the A2 Class in 1907, the DD's (and their rebuilt counterparts) performed sterling service on both branchline and mainline service for more than six decades and were to found over the entire VR system. A number of builders contributed to the DD construction programme :- Newport Railway Workshops (138), Phoenix Foundry - Ballarat (7), Beyer, Peacock & Co. - England (20), Baldwin Locomotive Works - USA (20), Walkers Ltd. - Queensland (20), Thompsons - Castlemaine (40), Ballarat North Railway Workshops (8) and Bendigo North Railway Workshops (8). The DD design was adapted for a tank engine, of which 58 DDE units were constructed 1908-1913, being subsequently reclassified D4 in 1929. Two DDE units were converted to tender engines in 1922/3. D3 619 is stored at Maldon for restoration and use on VGR. D3 646 is stored at Maldon for restoration and use on VGR. With the introduction of the C Class 2-8-0 heavy freight locomotives in 1918, plans were prepared for a similar but lighter axle load general purpose locomotive capable of operating over branchlines laid with 60lb rail. 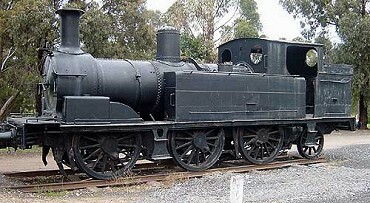 These locomotives were to replace aging 0-6-0 units and supplement the DD Class. 10 'K' Class locomotives were constructed at Newport Workshops during 1922 - 23 (Nos. 100 - 109) The design proved successful with the locomotives employed on both branch and main line duties. They could be turned on 53' turntables and operate virtually anywhere on the Victorian system. Although limited to a maximum speed of 40 miles-per-hour, their higher tractive effort than the DD Class made them particularly suitable for branchlines with steep grades. In 1923 an agreement on rail gauge standardization was reached, and the decision taken that future locomotives would be suitable for conversion to standard gauge (4' 8½). Both the C & K class locomotives were unsuitable for conversion. Yet, during the Second World War an acute shortage of locomotives lead to the construction of a further 53 locomotives to the "1922" K class design between 1940 and 1946. Some minor improvements were incorporated in this series, with the final seven locomotives being fitted with balanced Boxpok coupled wheels. The members of the original batch of K class locomotives were renumbered, becoming Nos. 140 - 149. The second series carried Nos 150 - 192 from new. During the 1950's the maximum speed for the class was raised to 50 miles-per-hour. K 157 is stored at Maldon as a source of parts for use on the other VGR operating locomotives. Restoration to service of this locomotive is a long term objective. K 160 has been in regular service since 1986 on the VGR. 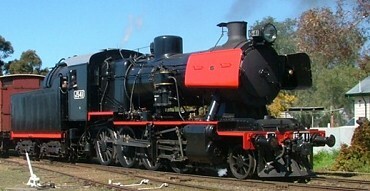 K 190 is on loan to the VGR from Streamrail Victoria. 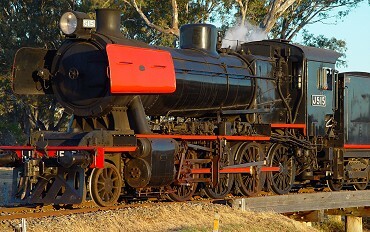 Post Second World War revitalization of the Victorian Railways included an updated design of the K Class. The Vulcan Foundry in England built 60 "J" Class locomotives, these units entering service in 1954. Incorporating many of the basic specifications of the K's, these locomotives were constructed for easy conversion to standard gauge. Like the K, these units were available for the entire VR system, could be turned on 53' turntables and were permitted a maximum 50 miles-per-hour. 30 units (Nos500 - 529) were coal burning and 30 units (Nos530 - 559) were oil burning. 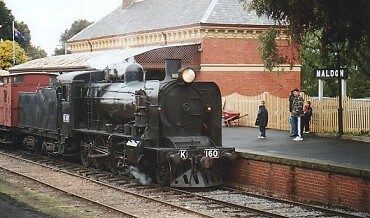 The J Class proved to be the last class of steam locomotive to enter service on the Victorian Railways. They quickly displaced the aging D2 and D3 4-6-0 locomotives on branchline duties. 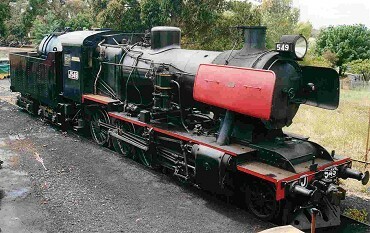 J515 is on lease to the VGR from Seymour Railway Heritage Centre Inc. Currently undergoing repairs to several boiler stays. J541 is on lease to the VGR. This locomotive is privately owned. 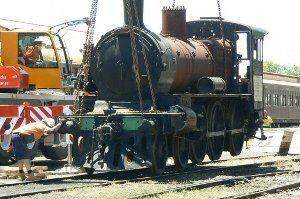 On 5th September 2007 it commenced regular passenger service work on the VGR following major restoration at the Puffing Billy Facility at Menzies Creek and certification for use on the VGR. 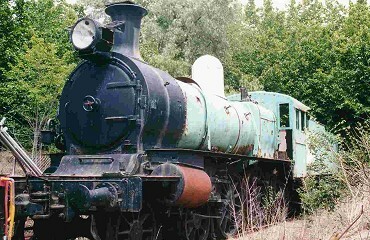 J 549 was in regular service until May 2004 when it was withdrawn to permit new tyres to be fitted to the engine wheels. The wheels have been retyred and the engine is back on its wheels. The smoke box has been removed in preparation for fitting of a replacement. With the significant increase in the Melbourne Suburban Traffic during the latter 1880's an update of the locomotive fleet was necessary. In 1889 a 2-4-2 Tank engine was received from Kitson & Co. of England. A total of 70 further engines were constructed locally (25 by David Munro & Co, South Melbourne and 45 by the Phoenix Foundry, Ballarat) between 1892 and 1894. These engines were the mainstay of the suburban services until the arrival of the DDE locomotives in 1908. Electrification of the suburban network from 1918 displaced the E class, many of which were either withdrawn from service or sold. When a need for shunting locomotives arose, the E Class was adapted to an 0-6-2 arrangement with some modifications. 5 of these EEClass (Nos462 to 470 even numbers) were built by the Phoenix Foundry Company of Ballarat in 1893. The classed increased in number with the conversion of 24 of the 2-4-2 tank 'E' class units between 1898 and 1924. During the late 1920's the 0-6-2 tanks were reclassified as 'E' Class. E 371 is on display at Maldon.